And greetings friends. This is Herbert W Armstrong with the Good News of the World Tomorrow. Did it ever occur to you to wonder why so many people make a failure in life? Is there, after all a reason for it? Are there any fixed basic rules, or principles of success? When I was a young man of twenty-three, I was on the editorial staff of a national magazine. They gave me the title of 'The Idea Man.' I was equipped with a portable typewriter, a large postcard-sized camera, and a hotel credit letter which authorized me to sign and cash drafts on my magazine for expense money, just as I needed it. I was sent on tours over the nation covering some ten or fifteen States on each tour. My job was to visit stores, businesses of all kinds, to interview heads of manufacturing concerns and various business men, Chambers of Commerce Secretaries, in all towns and cities along my route, the route that I was traveling, towns of 5,000 population and over. And to discuss with business men their problems, to get the ideas that had been successfully used in increasing sales and cutting costs and enlarging businesses and in producing larger profits. One of the things that the editors of the magazine wanted me to study and to try to determine, was to learn why one man made a success of his business, and another made a failure of it and became bankrupt. Why do we have so many bankruptcies, so many failures, even in business? Why is it that so many men, well they just get a job of any kind, they go on through life, and in old age they are dependent on their children or on charity, or on a pension from the state or the government? Something we didn't used to have. Why is it that perhaps — I saw the statistics some time ago, I don't remember now just what it is, but I believe that it was somewhere above 95% of all men passed sixty years of age, are not even self-supporting any more. Now why should that be? I remember, in asking the business men and heads of many businesses, as to their opinion about this thing and why one man would be a success and another a failure. The manager of the large J.L. Hudson Department Store in Detroit thought that one big reason for failure in business was a lack of capital. Now a majority of the business men I interviewed however, thought it was lack of ability. Well through the years since then I have been looking at this question of success or failure, studying case histories by the hundreds. Let me tell you that I have come to the conclusion that no person need ever be a failure in life. Every person was put here on this earth to become a success. The Eternal God intended every person to find happiness and to have joy in life, to have reasonable prosperity, to live a full, happy, abundant life, to achieve real success, and yet very few ever achieve it. Now why? 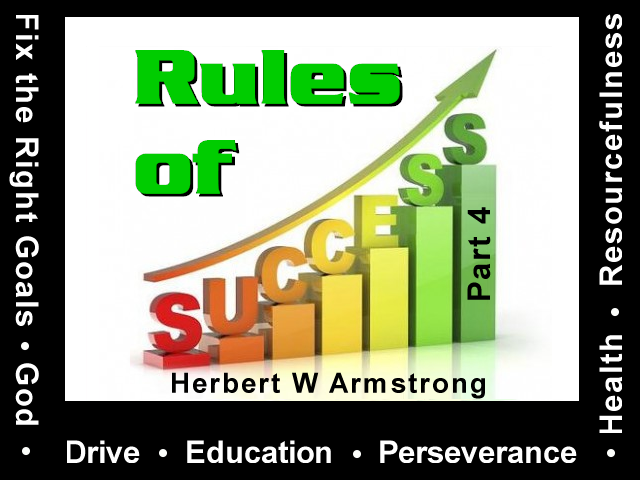 Are there definite rules that determine success or failure? There most certainly are, my friends, but how many people know what those seven basic rules are? Because there are just seven primary, fundamental rules that determine success. Now if this were merely a commercial, and I had some copyrighted plan to sell you for a high price that would guarantee to make you a success, I suppose thousands upon thousands of you would be glad to pay the price if you could buy it. But this is not a commercial, there is nothing commercial about this 'World Tomorrow' program, we have nothing to sell. The truth ought to be given to people and it ought to come free, just as free as the air. And the real truth is free if you know where to find it. And so I propose now, in a short series of these daily programs to give you the 'Seven Rules for Success.' Surely everyone desires to achieve success but very few know these rules for its accomplishment. Now in my lifetime I have had close and intimate contact, almost constantly, with successful men. I have met successful men by the dozens, the scores, and the hundreds. I have talked with them. I've read books written by such men and books written about such men. I know how they think, I know what they do, and I think I've come to learn why they have been successful and why other men, and why the great majority, of not only men, but people, women too, have become a big flop — in plain language — have made a big flop of life, a big failure out of life, why they are unhappy, why they end up poor and in poverty, terribly unhappy, frustrated. Every one of you can turn your life into a real success. Now the average person today is not a success because he does not recognize or follow a single one of these seven basic rules or principles. Now mark that well my friends, the average person is not applying a single one, not one of these seven principles, these seven rules that produce success. They will produce success for you if you follow them. Now I'm going to give them to you in time order, and I'm going to take plenty of time to give them to you. I'm not going to give it to you in this one program. I'm not even going to cover, or finish covering the very first rule in this present program. I'm not going to try to. I want to go into enough detail to make this plain so that you can become a success. I'm not going to give it to you in the order of importance, but in the time order, the natural time order. Alright now, first, the very first rule of success is that you fix a proper goal. You've got to know where you are going. What is success and what do you want? Where are you trying to get to? Where are you aiming? You're not going to shoot any higher than you aim. You've got to have a right purpose in life because success is absolutely impossible unless you know where you are going. It's impossible unless you are strongly motivated, and you can't be motivated for success unless you know where you are going. And you cannot be strongly motivated unless you are imbued with definite purpose. Now were you put on this earth for a purpose? Is there a purpose in life? Did you just happen or were you put here for a real purpose? The very first thing to know is what that purpose is. Now there is an overall purpose in life, and let me say right here that you should have one overall goal in life, and then perhaps a sub-goal under that, as to a definite occupation, or a definite profession or job, or kind of work wherein you are going to work in your life to fulfill that goal. Now I happen to be president of Ambassador College, and we have problems with students here in the College, and I notice that in many educational institutions, many colleges and universities over the land, the purpose that seems to be fixed for students, is first the development of their intellectual powers, which may or may not lead to real success. And secondly, professional, or vocational, or technical training to teach them how to earn a living in some field. Well now that might be important, depending on whether you belong in that field or not. Let me stop right here and say that when I was traveling over the United States, back at age twenty-three, interviewing all of these men, I didn't find a single one that seemed to hit the real nail on the head, that seemed to really understand the real reason for so many failures. You know the reason I found, first of all, was, well trying to fit the proverbial square peg in a round hole. Well maybe they were what some of the teenagers today call 'squares.' I don't know, but anyhow it was the old square peg in a round hole. In other words, most men were in the wrong business, they belonged in some other business. I found many retail merchants in small towns, in those days, that had been farmers. But you know, they had read what mail order catalogs used to tell them here over forty years ago, that the city merchant you know, sat around and had an easy life, and just made excess profits, and lived off of these farmers while they worked and they slaved away at plowing up their fields and in reaping the harvest and all that sort of thing, and milking their cows and doing their chores. The farmers were working from before sun-up sometimes until after sundown at night, and it was hard work. And they'd go into the store, and that looked pretty easy you know, the man there just to get some things down off the shelf and wrap it up and wait on them. And so they thought that's an easy life and he's making all the big money, I'm going to sell my farm and become a merchant. So they sold their farm, they invested it in merchandise. Now they weren't prepared to be a merchant, they didn't know anything about merchandising; they didn't know anything about salesmanship; they didn't know anything about costs and about profit and loss; they didn't know how to run a business. They didn't even know how to keep their records. They got in the wrong business and they made a total failure. And actually, most of them found that they had jumped, as you might say, from the old proverbial frying pan into the fire, because they were terribly unhappy. They had worries now, not so much physical work perhaps, but it was a lot harder work because now they had worries, and they were in a job they didn't really know anything about. Well it was a square peg in a round hole. They didn't belong there. The first thing to do is find where you belong of course, and get in the right place. But there is an overall purpose in life that very few people have ever found. There is one overall purpose that applies to every one of us, beside the, shall we say, the sub-goal of your particular job or profession, or occupation, or whatever it may be, the vocation that you follow. Now I am thinking of one man that I knew. I think I have told you about this man before, and I won't mention his name because, while this man has been dead now a good many years, perhaps many of his family remain and I wouldn't want to throw any discredit on him for that reason. But this man was president of one of the large automobile companies, one of the large automobile manufacturing companies that is still in business today. But in the Depression of 1920, this automobile business went practically bankrupt. Of course later, new capital was put in, new management was thrown into it, it was all refinanced and still going on today. But this man that I had known that was president of it before this crash in the economic depression of 1920, went out and committed suicide because he lost all his personal fortune. He lost everything he had. Now would you say that that man was a success? No, he was not a success. He was terribly unhappy. You know, I think I've told you of a man that I knew who was president of one of the large banks in New York City, on Wall Street. I spent quite a little time with this man, in fact I knew him in Sioux City, Iowa when he was president of a bank out there in Sioux City, Iowa before he had ever gone to New York. He was a gentleman. He was a very quiet man, and yet he was a very successful banker because he had, well very accurate judgment, and he was a skilful banker. Well later on there were consolidations in New York City. Many banks went together, they formed one great big tremendous bank that became the largest bank in the world. And this man that I knew, had been promoted to a position two steps higher than the president of the largest bank in the world. Now they had to have higher offices and as a good many banks, of the larger banks had in those days, they had a chairman of the board in addition to the president. The chairman of the board was a higher office than the president. Well they had the Chairman of the Board of Directors but now they elevated another job higher than that. That was Chairman of the Executive Committee. And this man that I knew, that was my friend, was Chairman of the Executive Committee. He was higher up than the Chairman of the Board. There was one other man higher than he, that was Chairman of the Governing Board. Banks can get lots of titles. Well not so long ago I stopped into that bank down on Wall Street, New York, and I began to inquire of some of the officers, "Whatever happened to this man?" Of course now when I knew him it was forty years — over forty years ago. I wondered what had happened in the intervening forty years. Of course he was an elderly man at that time and I was pretty certain that he would not be living at the present time. He would probably have to be quite a little over a hundred years old. Well they said, "Who? And I had mentioned his name again, and they said, "Why we've never heard of him." The various officers of that bank now NEVER HEARD of him. A man that had struggled all his life to become a success and he had mounted up to a position TWO STEPS HIGHER than the president of the biggest bank on earth. I went into that bank some forty years later and the officers said, "Why I've never heard of him." Well there you are. Was that man a success? Listen, my friends, where are you going? Are you just drifting? Are you in anything that is really going to make you a success? And just what is a success and just what is the real purpose of life? You know most people just enjoy the passing moments. They think of the five senses of which they want pleased. They like to see beautiful things. They like the fragrance of things that smell nice in the nose. They like the taste of things that they enjoy, and often we've created artificial tastes to like things we shouldn't eat that aren't good for us. They like to hear the kind of music they want, or the kind of music that does something to them, as a lot of people do today. And sometimes they get a sort of a perverted appetite in music too, get to liking the kind of music that does things to them that should not be done. Yes, and the sense of touch and feel are appetites, all of these things. And then there's one thing that people do like and that is to elevate the self way up. You know the very essence of the average human mind of in fact the human mind, any human mind, is vanity. We want to exalt our own selves and we want to please our own selves, and we want the passing moments to be pleasing and pleasant, and something that is enjoyable, and if we can get a few thrills out of life and a little bit of excitement as we go along, that's what we want! But we are not looking over into tomorrow. Most people aren't looking ahead very far. Now are you just enjoying the passing moment? Are you just drifting? Are you like nearly everybody, merely a victim of circumstance? Listen, why are you in the job where you are? Did you just look for a job and you took the first one that you came to? Now when I was a young man, fitting myself for a definite goal and a definite purpose, which I had beginning with age eighteen, I didn't just take any job. I didn't go around saying, "You don't need no help do yah? Well I thought so," and then walk out. I first examined to find out what job, what place, what specific job and what specific company would give me the training and the education that I needed and the experience that I needed to fit me for the goal that I had found to be my goal in life. At least that one was my goal at that time and I'm going to tell you later of a later goal that I found that was a much better one. Now I remember in one case I thought that what I needed to do was get a job with an advertising agency in Chicago. So I stopped in. For mail in advertising agency as it was at that time, they're not in business now, but I got a job with a mail advertising agency. I got out to Des Moines, Iowa, where I lived at the time, and my Uncle, who was the leading advertising man of the State of Iowa, and who was my advisor, and sort of coaching my life along in those days, said, "No," he said, "You're not ready for that yet, that isn't the place where you should go." And he told me of a certain magazine that I should be with. And that's the one that later sent me around the United States, as I just mentioned at the beginning of this program. He said, "There are two men up there that know more about merchandising and advertising in my judgment than any two men in the United States. You'll be directly under them and you will get a training and an education from those men, and an experience that you will never get anywhere else. You go and join their institution and you get your education there." Alright, I went up to the advertising manager of this magazine and I calmly and coolly announced to him that I had decided to join their organization in the advertising department and that I would start work on the first Monday of the following month. Well you know, this advertising man looked at me rather curiously and contemptuously. "Oh," he said, "Well you're a cool one," he said, "So you've just come in and deliberately hired yourself a job with us, is that it?" "Yes," I said. "I guess that's about it." "Well," he said, "We don't need any help and we don't have any opening." Well that didn't rebuff me, I was determined I was going to join that institution. I didn't look for just any job. I said, "Well then," I said, "You'll have two weeks to create an opening if you don't have one." I said, "I think you are smart enough a man to create an opening in two weeks." He said, "I don't think you understand plain English, young man, I said we don't need any help, there's no room here for you." Well now about this time I was getting my ire up too a little bit. I said, "Let me look at that lousy sheet of yours," and I pulled it over and I said, "Look here, is this a national magazine?" I said, "Do you mean to tell me that a national magazine, a magazine of national influence and standing, can't even create an opening for a young man like me?" I said, "How often do you find a man like myself comes in here that studies nights and is trying to improve himself, is going to go clear to the TOP?" I said, "You can't get men like me very often." I said, "You'd better take me while you can get me." Well then he didn't know what he would have me do, but I saw he was weakening a little bit. Now I was just as cocky and conceited in those days as I could be. I think I have told many of our listeners how God took that out of me later, and some critics I guess think it isn't out, but God knows my heart, and I think I do too. And nevertheless, he didn't know what I'd do. Well I looked at the Want Ads. Now I had been in the Want Ad department of a daily newspaper, and I found that Want Ads are solicited and sold, and they don't just come in automatically, like most people think they do. You pick up the Want Ad department of your daily newspaper and you think those people just take Want Ads in? You'd be surprised how many salesmen they have that go out and get those Want Ads. That's something the public doesn't know much about. Well I learned that years before as a young man. That's where I started in the advertising business, years and years ago. "Well, I said, I can build a full page of Want Ads in your magazine. Is that worth anything?" "Well," he said, "Sure it is, but we're not a Want Ad type of magazine, we're a national magazine, not a newspaper." I said, "It doesn't make any difference, the principle's the same, I can get you a full page of Ads." "Well," he said, "We can't pay you very much." And I said," I didn't ask anything about the salary, I'm still living at home with my folks." And I said, "I want the job." So I said, "I'm coming up here." "Well," he said, "Alright," he said, "We'll try and fix something." Well I was with him for three years and then I quit of my own accord, and I might have been with him yet today, and I'm glad I quit because I would have, and then I wouldn't be where I am now, talking to you here. Well, the point is my friends, that most people just drift around. They drift into any job. They don't find what job they ought to have and know how to go and just simply sell themselves, so to speak, and get that job. Well I know that I always picked the job. I decided what I was going to do. I always wanted to be master of my own situation and circumstances but most people are victims of circumstance. Circumstance buffets them around. They don't know why they are where they are. Why do you live in the State where you do? Well you just found yourself there. Have you had anything to do with it? Have you decided where you are going to live? Have you decided what business you'd be in or what kind of work you would do? No, most people just never think of these things. They have no goal! They have no fixed aim! They're not working toward any definite objective or purpose. Well no wonder they just drift, they let their minds drift, no wonder they're failures! Well now what about earning a living? Is that you're one and only goal — to earn a living in the kind of job you should have? Earning a living should be only one of the means to the real objective of life if you know what it is. And still that is very, very important — that you be in the kind of occupation where you fit. And every man can be a success, and I mean financially a success if he is in the right occupation. If he tries, if he puts forth the effort; if he will apply and use these seven rules of success. Now listen, you were born for a purpose. You were born for a purpose. Do you know what that purpose is? Did you just happen? No you didn't. You've got to know that purpose because very few know. Very few men have the ambition to get anywhere in life, and it takes ambition. It takes drive. It takes other things, but you can't have those things unless you know where you are going. Now you have a life to live, and here you are already well along in life aren't you? A lot of your life is gone already. Where are you going? Most of you don't know, you're just aimlessly going along and now you're stuck. You are in a rut. You are where you are, you're finding it pretty hard to get out, but you can still start to do something about it. You can still learn where you should be headed and begin to plan and prepare and train yourself for it instead of just drifting aimlessly along. You know, sometime back, I found several students here at Ambassador College just floundering around. Their grades were going down. Professors began reporting to me, but I found the reason. When I talked to these students they had no objective. There was no purpose. You know if you are not interested in what you are doing, you are not going to do it well. If you have a goal then you are interested in what you are doing, you know where you are going, and you want to keep on until you get there. Yes, first in order of the seven rules of success is to have a right goal in life, not any goal but a right goal. Aim in life that will inspire ambition, that will move you on to success. I remember one girl we had that had a goal before she came to Ambassador College and we found she was bogging down here, she didn't have any goal. She said her goal had been accomplished. The only goal in life she had was to get to come to Ambassador College. Now she was here, her goal was accomplished. Well, we had to show her a bigger goal ahead, it's going to take her the rest of her life to find it. And I think she is on her way now. You know, many try to fix a goal by asking, "Well, am I going to be a teacher? Am I going to be a doctor or a lawyer, a salesman, a writer, a minister, a merchant, a farmer? What am I going to be? Or am I going to be a stenographer, secretary, librarian, an office manager, or am I going to be a housewife or what? What specific job shall I prepare for? Well you should have a specific occupation in life but that really is a sub-goal when you learn what your real goal is. Now we have that thing, we face it every Fall here at Ambassador College, young people coming in. What courses should they take in College? Well we give aptitude entrance examinations to try to determine where each student fits, to help them along that line. I remember that when I was age eighteen, I found a book in the Public Library in Des Moines, Iowa, it was titled, 'Choosing A Vocation.' I studied that book from one end to the other. Now it went through a complete, self-analysis of the individual. It analyzed and brought out every fault, every weakness, every short-coming, the things that you hate and detest that you can't do well, that you don't like to do. And then the things that you really enjoy doing, the things you can do well, the things where you have perhaps some talent or some ability, and all that sort of thing. And then it went through all the different occupations and vocations, and professions and everything of the kind to see where that individual with those particular good points or weak points or talents, or whatever it might be would fit. Now I thought I fit the advertising profession, and I did. What I didn't know was that it also fit what I finally, and later had been called to and that every bit of the experience I got in the advertising profession was only fitting me for what God Almighty really had in store for me and what I was really being called to. Well, I guess I was too far away from the Almighty God to even recognize it or know it in those days. Well now, you know most people have a, sort of a general idea about life, a general desire just to enjoy life. Too many girls have ideas like this, they have a main desire to look pretty, to have an attractive figure, to wear nice clothes, to be well thought of, to be whistled at, some of them want it anyway, or to get a husband or just to find happiness, or they want security. But some of course would like to be business men and learn to manage men. Now men have a set of things they would like to do too, but I see that second hand has gotten up there and my time's about up. Listen I am going to have to cut that right off here and I'm going to go on and tell you more about your aim and your purpose in life tomorrow and these seven rules of success. And I want to tell you about this 'Ambassador College Correspondence Course' of Bible study. Never has there been any Bible study course like this. Listen seriously just a moment. You know that you have not been studying your own Bible as you ought to, you know that. Perhaps you haven't known just how to study it, and not understanding it, it may have seemed rather dry to you. But with this 'Ambassador College Correspondence Course,' the Bible will become a new book, a living book; The most interesting, the most thrilling study that you ever went into in your life. Now remember this is non-sectarian. It brings you no denominational interpretations. It shows you how to let the Bible interpret itself and it shows you how to study your own Bible, and it will make it the most fascinating, the most interesting, the most important book that you ever read. Until next time, goodbye friends.